Want to gain an advantage over your competitors? Want to dramatically increase your bike’s handling? Want to decrease your lap times? Want to win more money? 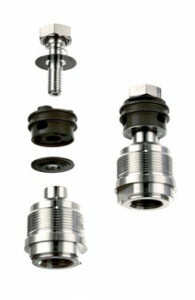 In response to restricted quantities and wait-listed offerings from manufacturers in Europe, GP Suspension designed proprietary supersport cartridges to exceed competitor’s performance characteristics and provide a superior American built product at a very competitive price point with unlimited production runs and immediate availability. These cartridges have been rigorously tested and developed by AMA teams and privateer riders, and are now in widespread use in AMA competition with teams and privateers. The tests gave an average reduction in lap times of two seconds per lap and at the top level, that is a winning advantage! 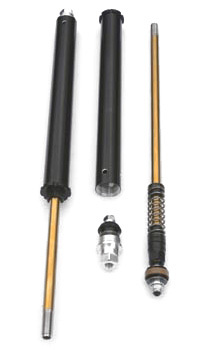 In order to improve the performance of OEM forks, GP Suspension offers bolt in 20mm proprietary compression and rebound kits. The kits are constructed at the shop to order, to ensure that the valving meets your individual requirements. These compression and rebound kits have been rigorously tested and developed by AMA teams and privateer riders at the national and club level, and are now in widespread use in race and street bikes.